Sometimes you can see change coming, and sometimes it sneaks up on you. This month's issue features technologies that have yet to make a big splash but seem ready to burst onto the health care scene. 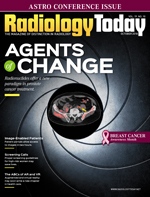 Our cover feature by Dan Harvey reports on new PET tracers that are showing potential for simultaneously imaging and treating recurrent prostate cancer. Some in the industry are still debating the proper term for these types of agents but, for lack of a better word, "theranostics" are generating some buzz; their potential to allow physicians to adjust treatment in real time represents a paradigm shift in cancer treatment. Although still in the very early stages, researchers are making significant progress in developing and deploying these treatments. Another innovation that seems destined to take health care by storm is mixed reality. A panel of experts provides their rundown on the potential uses of augmented reality (computer-generated images on a real-world background) and virtual augmentation (real-world images on a computer-modeled background). Physician training seems like one of the first places where mixed reality will change the status quo, but it's already been employed in medical procedures, notably for needle placements, and the possibilities for additional use are expansive. Perhaps the most momentous shift of all, however, will be not in how physicians treat patients but in how they interact with them. Beth W. Orenstein details a patient portal project that is drawing quite a bit of interest. For a while now, people have been asking when health care will shift to a consumer-focused model that more closely resembles banking or retail. One big hurdle has been allowing patients to access and share their medical records without having to tote a library from doctor to doctor. Patient portals such as the one Orenstein profiles are a significant step toward eliminating paper and CDs while increasing patients' ability to share their data. Finally, it's important to mention that October is National Breast Cancer Awareness Month. Keith Loria takes a look at screening guidelines for women with a high risk of developing breast cancer as well as what can be done to improve awareness and catch breast cancer early, when it's easier to treat. As Debra Monticciolo, MD, FACR, the immediate past chair of the ACR Breast Imaging Commission, remarks in the article, "There are a lot of people at high risk who just don't appreciate that risk." Loria also covers some newer methods that may make screening more tolerable for more women.